Hey everyone, Deanna here with a new project for you from Dies R Us. I made this card using the new Lawn Fawn Dad and Me stamp and die sets and the Stitched Mountain Borders Die set. The Dad and Me stamp and die set is a great set to add to your supplies. It can be used for many different masculine cards besides Father's Day. To make my card, I started with a piece of watercolor card stock that I cut with the largest Memory Box Stitched Rectangle Die. I used Tumbled Glass distress ink to create my sky and Mowed Lawn distress ink to create my grass. Next I die cut my Stitched Mountain Borders Die set to create the mountains. I stamped the river from the Dad and Me stamp set along with the rocks. I also stamped the big bear and two of the little bears and colored them with my Zig Clean Clear Brush markers. I added the glasses to the big bear. Once I had all the coloring and die cutting done I assembled my card. I made this card for my two grandson's to give to my husband for Father's Day. This is really a fun card, and I love the play on words in the sentiment. The scene you have created with the dies is brilliant. This is so ADORABLE! I love the addition of the glasses, super cute! The mountains are majestic! oh my goodness that is just too cute, gotta love the glasses on the bear and those mountains are so neat, great scene!! 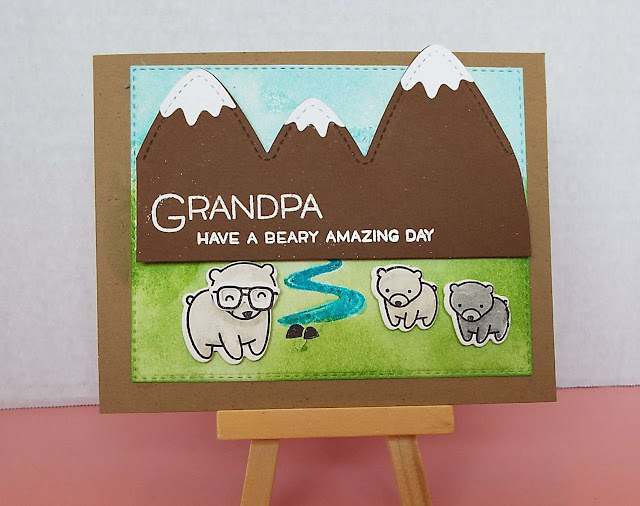 Your mountains and meadow scene remind me of a view in Yosemite.......cute card. How darling! Love your scene and sweet little bear! Deanna, this is such a sweet little scene you've created. Love it!! OMG how cute Deanna! Great job on this cute little scene! Love the scene and so perfect for Father's day.